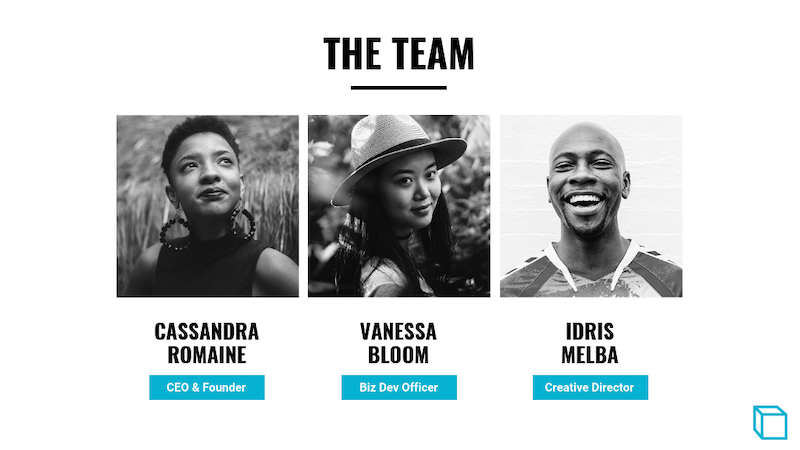 Let’s face it: presenting your brand, company, or idea to a group full of strangers is hard. A few of them know your company, but most of them have never heard of your brand. So you’re already fighting an uphill battle from the start. Plus there are so many things you want to talk about, but not enough time. 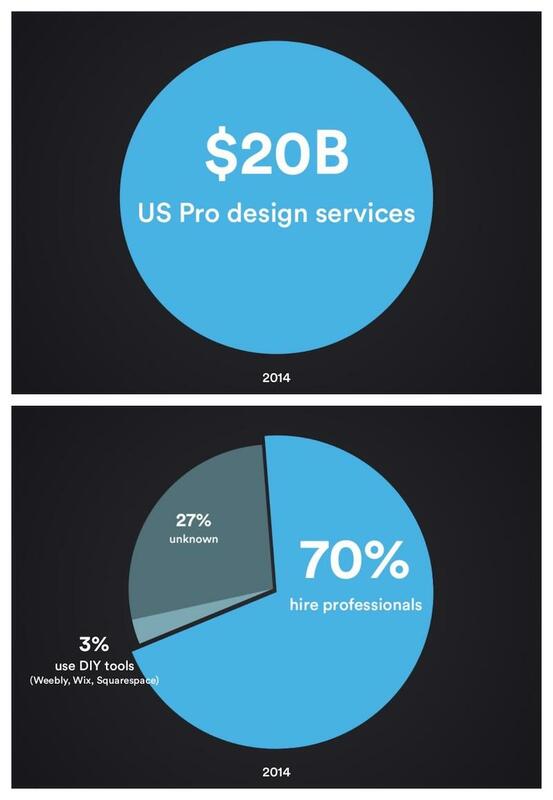 That’s why you need to make sure you have the best pitch deck possible to help you out. 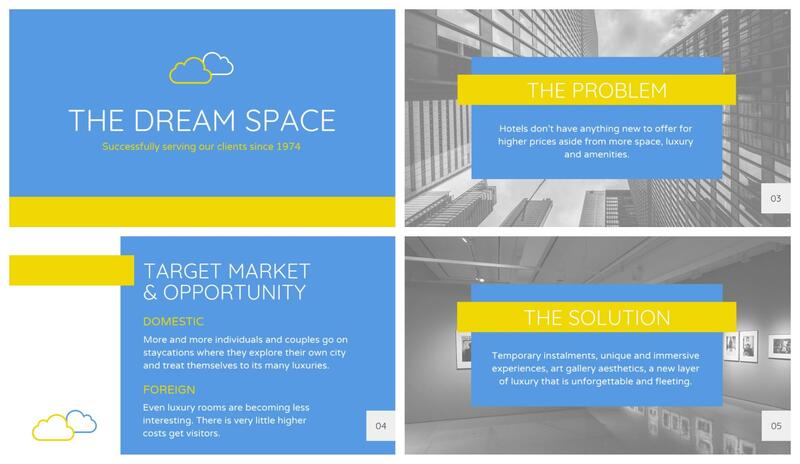 All of those things and more are achievable with a perfect pitch deck. You just have to take the time to create one that’s as unique as your ideas! If you’re not sure where to start, you really couldn’t be in a better place. 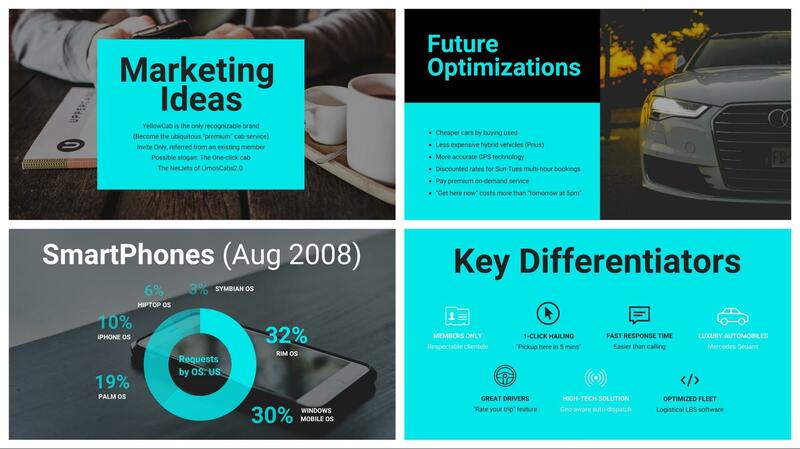 Below you will find a plethora of the best pitch deck examples, tips, and templates! I thought it would be fitting to start this article with a company that everyone has probably used, or at least heard about. 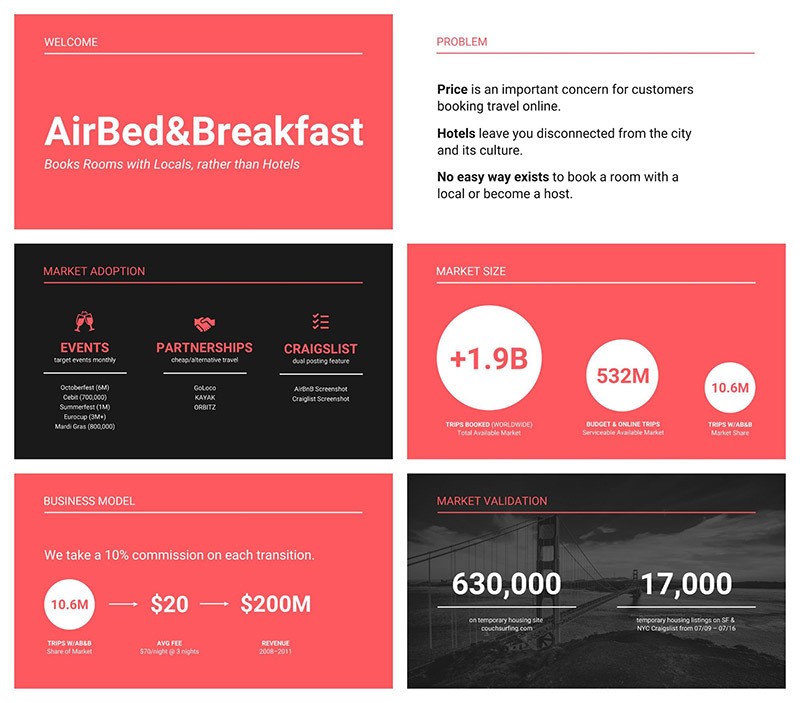 This Airbnb pitch deck also happens to be one of our most popular presentation templates! This rule of three has been drilled into my head since middle school art class, and that’s because it works. In my opinion, only the best pitch decks follow this simple rule on their slides. 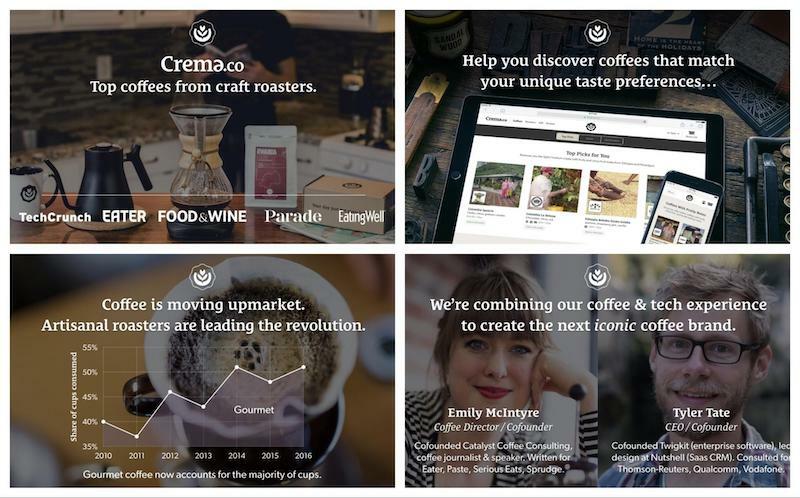 The best pitch decks tell the real story about your company or brand. You want to not only sell the audience on your product but also how you built that product from the ground up. 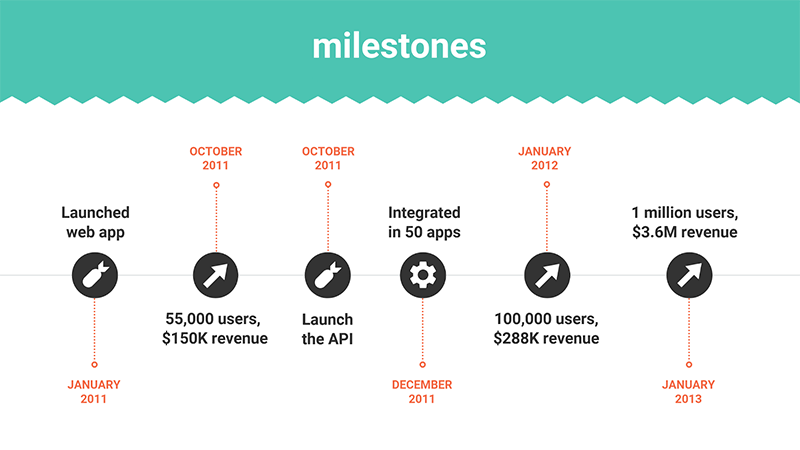 An extremely simple way to do that is by creating a company or product timeline like in the example above. 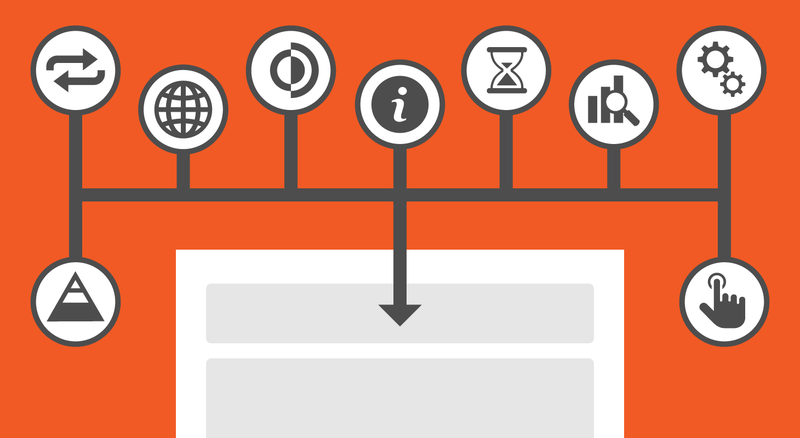 We have found that people are already very familiar with timelines and know how to read them quickly. If the designer wouldn’t have used a timeline, this information would have probably been spread over five or six extra slides! Another important part of your story is the people who helped you build the company. These people are the lifeblood of your brand and what helps it stand out from the competitors. Now I’m guessing you have already planned on adding them to the pitch deck. However, I would recommend using only a single slide like they did in this example. Whatever you choose to do, don’t forget to talk about your team and highlight what makes your company truly great. 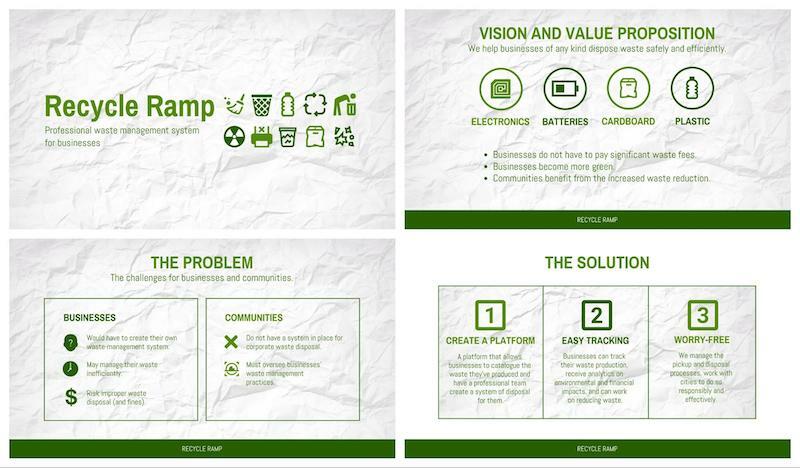 Explaining how your startup is going to solve a specific problem is a vital part of any slide deck. Without that information, investors and the audience are going to be left with more questions than answers. Make sure that your problem and solutions slides are easy to understand by using a similar layout on both. This will ensure that the audience will be able to quickly recall the main problem you want to solve. Not sure what I’m talking about? Take a look at the slide example above and note how they use almost exactly the same layout. This visual symmetry will help the audience connect your solution to the problem almost instantly. Even if the slides are separated by a few other points or ideas. Not everyone is going to be able to explain their problem and solution as succinctly as the previous examples. Some are going have to take a unique approach to get their point across. That’s why I want to highlight how Front masterfully visualized the problem they are solving. I think they realized it would be a lot easier to create a killer flow chart that visualizes the problem. As you can see, all they needed was a single visual to explain the core problems that they identified. Also, I really like how they distilled each of the problems down to a single phrase. 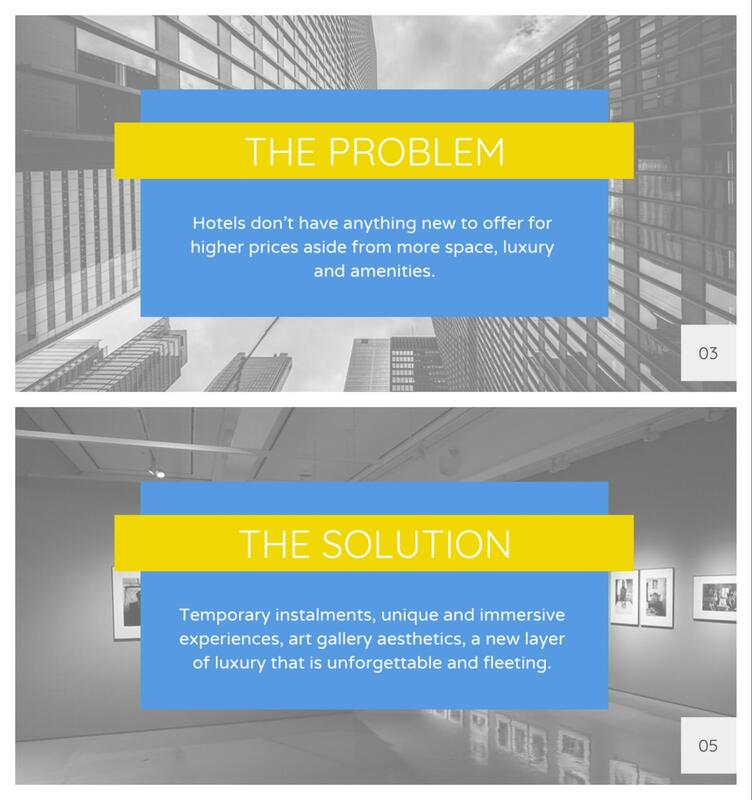 That approach, combined with the visuals, will help it stick in investors minds as the best pitch deck. Sometimes you’re going to give your pitch to a small room of investors. Other times it will be to an auditorium full of random people in your industry. And I can guarantee, not everyone is going to know your brand off the top of their head. Your job should be to make it extremely easy for people to find out more info or to contact the team with any questions. 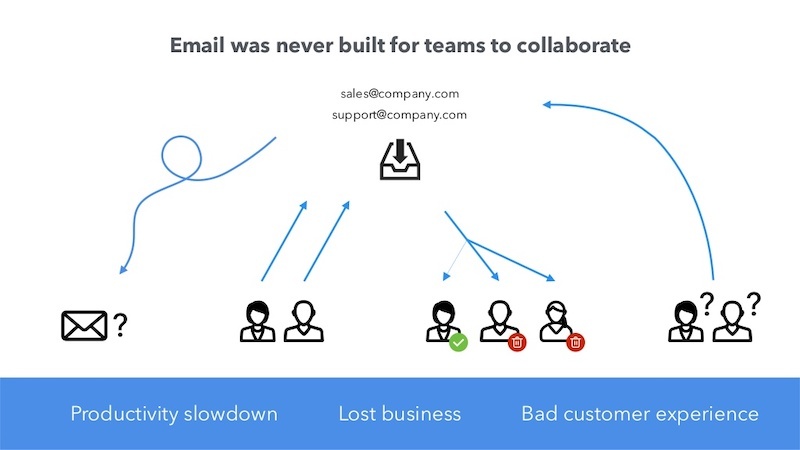 I would recommend adding this to the last slide, like in this pitch deck example. Or on a slide that will be seen the longest, like the title slide. This will help anyone that is interested write it down as the event organizers get things ready. 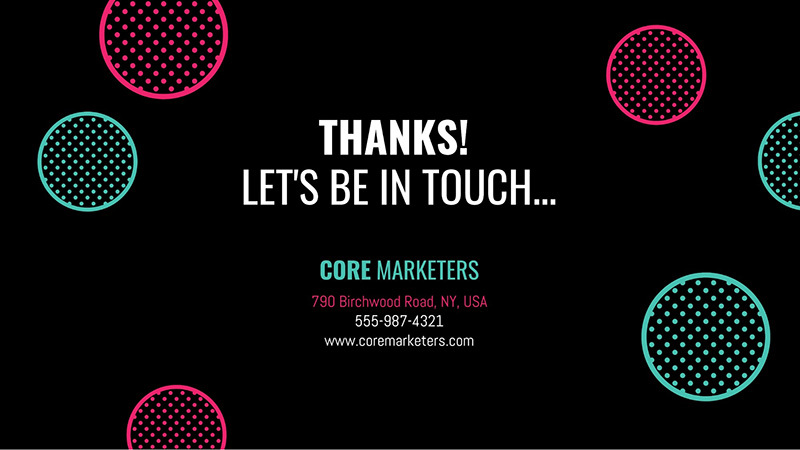 Helping the audience make the right conclusions about your company should be an important part of your pitch deck strategy. 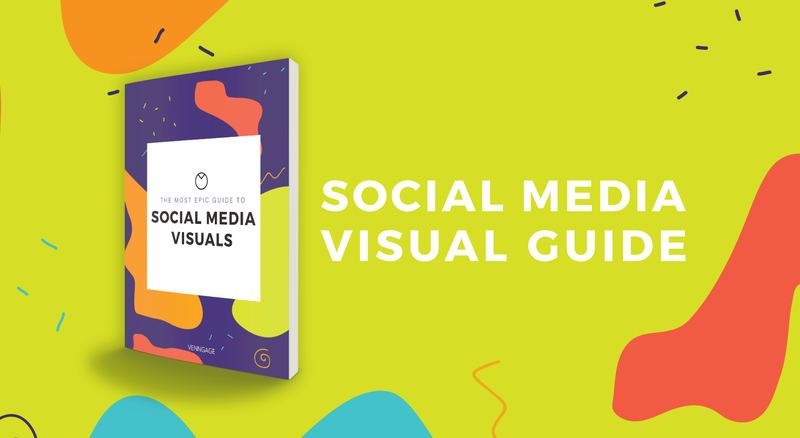 Without saying a word, the visual choices you make can greatly impact your message. 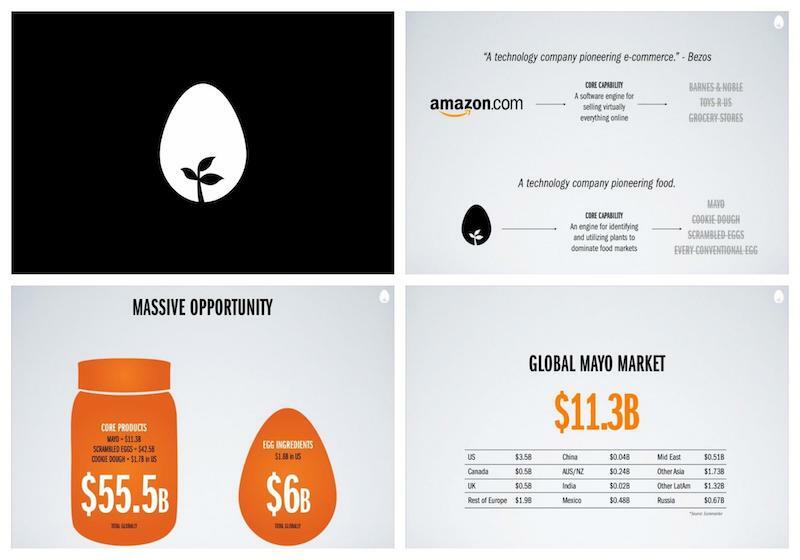 For example, take a look at the slide from an organic food company above. 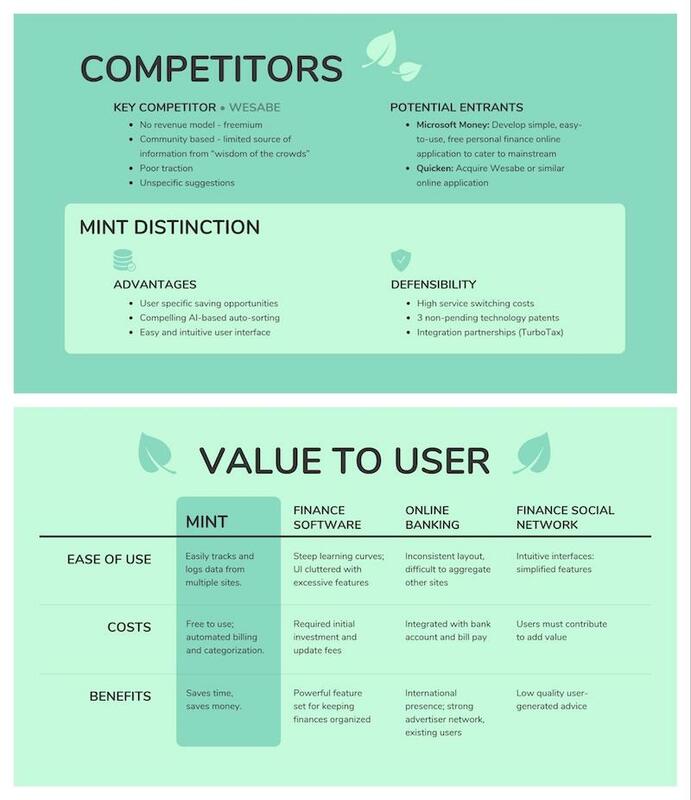 It splits the competition slide right down the middle to illustrate the differences. 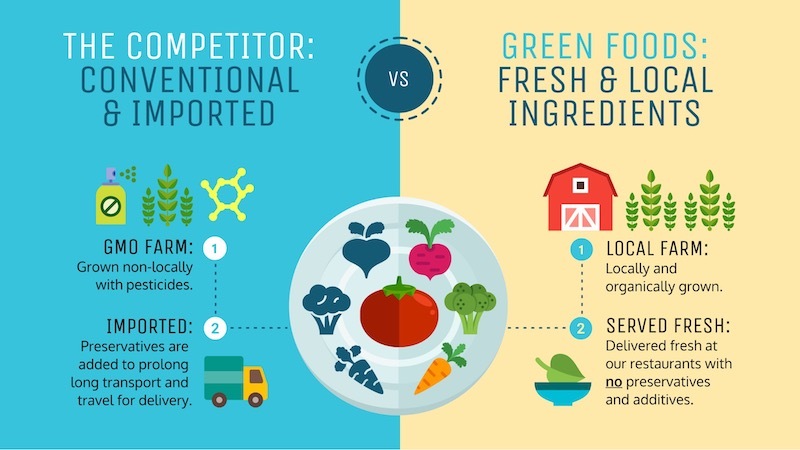 It also shows exactly how the processes differ between the two entities. I like this tactic because it shows how your company is better at a glance. It will also help them recall this information late because they can tie each brand to a certain color. The best pitch decks keep things consistent, mainly because there are so many moving parts in any presentation. 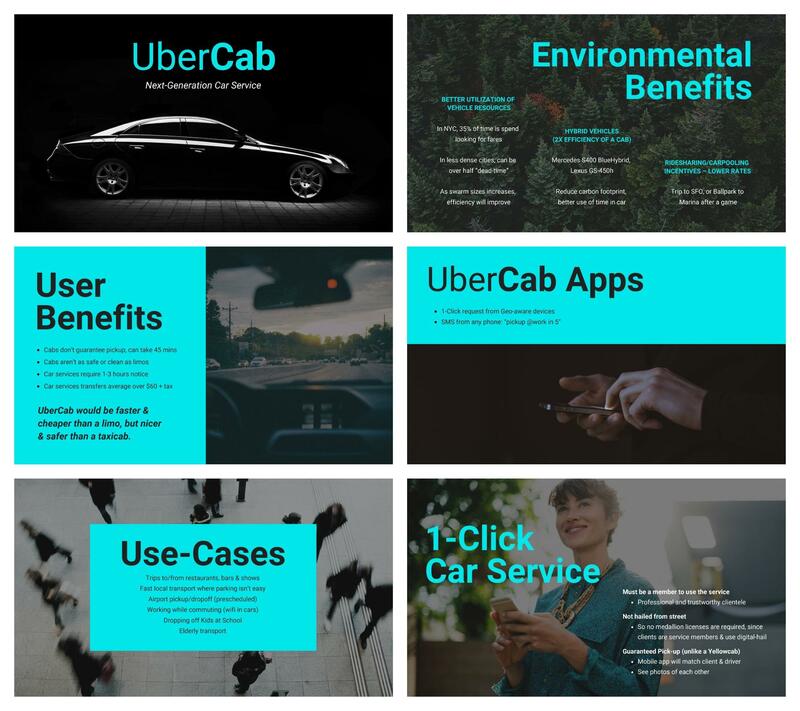 You want each of your slides to feel like they are connected by a singular feeling or theme. An out of place presentation background image can throw that off. 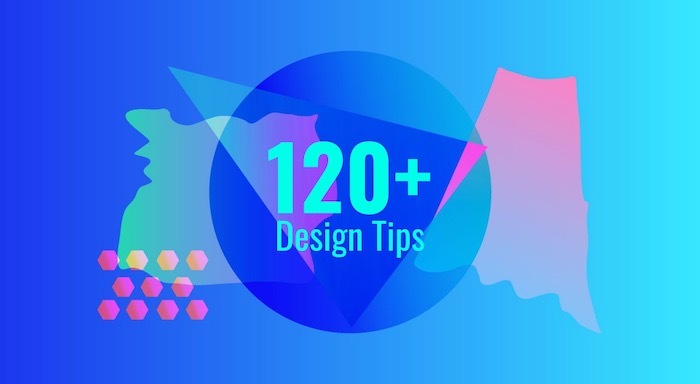 Keeping things consistent when you use a solid background color or pattern isn’t hard. But things can get a little tricky if you want to use different photos for your backgrounds. Also if you’re struggling to find exactly the same colored photos, you can use a color filter to make things a little more uniform. 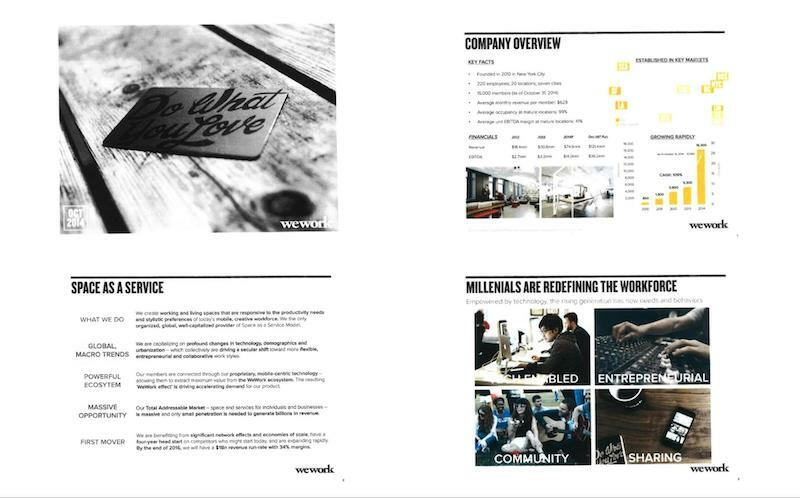 The behemoths at WeWork still have one of the best pitch decks, even though this is a handful of years old. 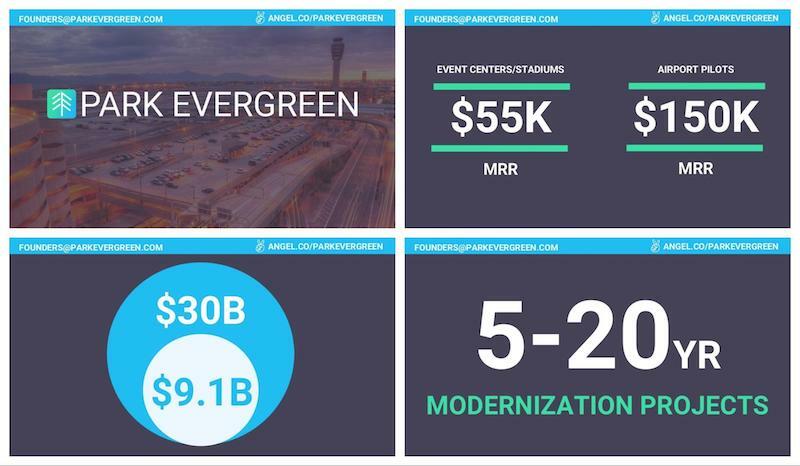 In fact, the slides contained in this presentation actually helped them raise money at a $5 billion valuation. My favorite thing from this example is that they outline their key metrics on the second slide. They waste no time getting down to business and let the audience know they are killing it from the beginning. 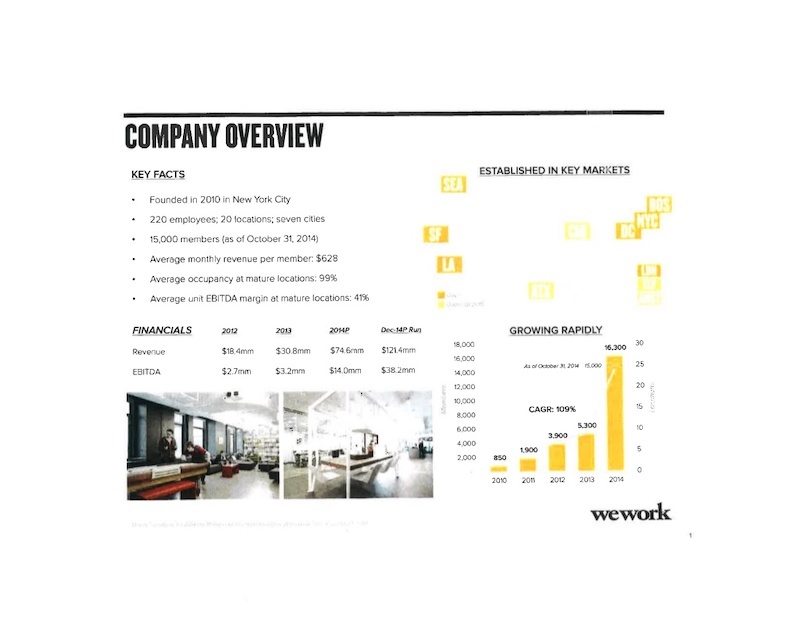 A lot of the time brands hide these metrics at the end of their presentation, but WeWork made sure to put it front and center. I think this illustrates that they are a company that values transparency and honesty. This approach puts the audience in a positive state of mind, which can help them be more receptive to the pitch. 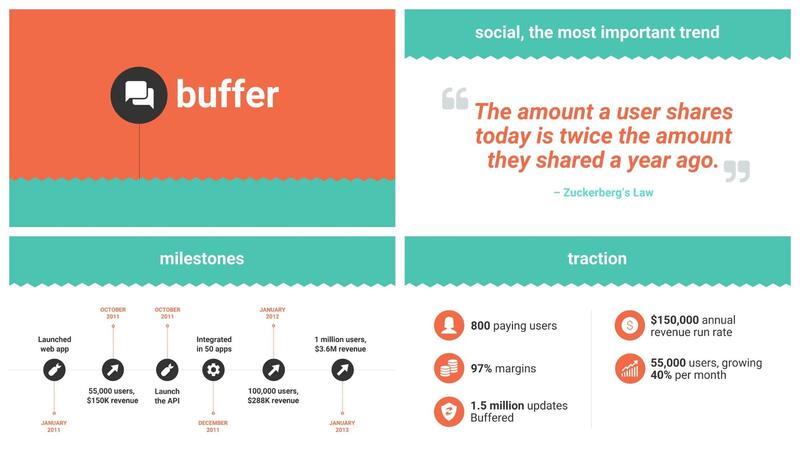 A lot of pitch decks are rather short, only covering a few main points across a handful of slides. But sometimes your deck needs to cover a little more information. There’s nothing wrong with having a long slide deck, as long as you switch up the slide layouts a few times. No one wants to see basically the same slide with different metrics or points across 25 slides. However, just make sure to keep the design elements, color palette consistent across all these layouts. Otherwise, you will have a very messy slide deck and annoyed investors. Sometimes you have to set the mood of the room before you jump into your slide deck. A simple way to do this is by adding a powerful statement or famous quote at the beginning of your slides. This may sound a little cliche but the creatives over at Crew use this approach extremely well in their pitch presentation. 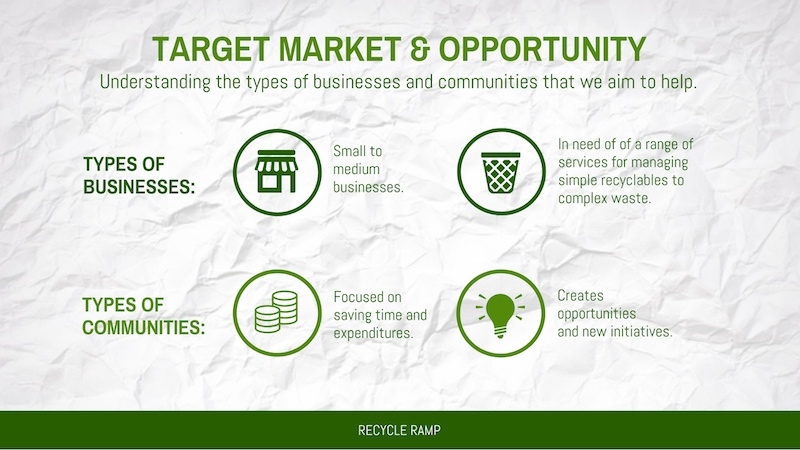 In the slide above, they make a very simple statement that puts the rest of the presentation in the right context. 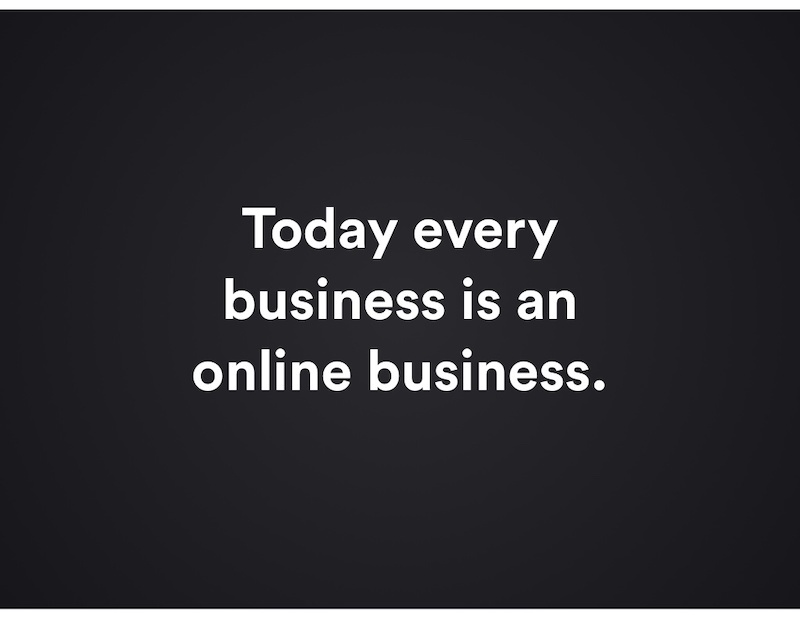 By claiming that every business is an online business, they instantly change the way that people think about the business sector. Additionally, the designers used this straightforward statement to set up the rest of the presentation perfectly. As you can see in the next few slides, the potential market is explained. Without the statement, I don’t think these numbers are as impactful. One of my favorite tips from my presentation ideas roundup article states you should never make the audience do the math. You can also use this mantra when you’re adding data visualizations to your slides. 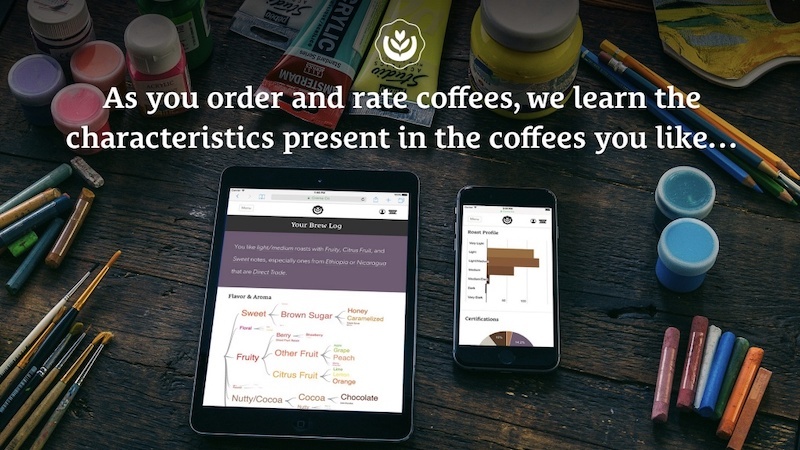 Make each slide extra easy to consume, as well as, easy to compare to other visualizations. 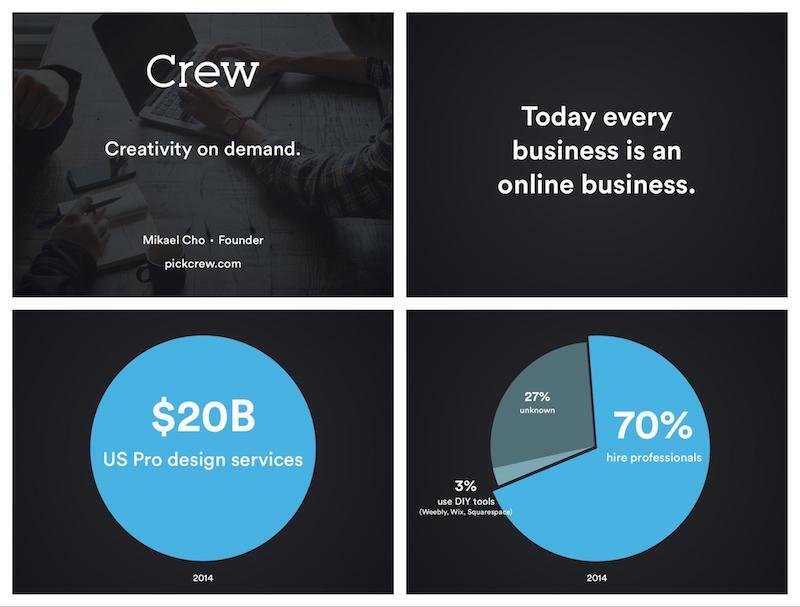 Let’s take a look at the graphs and charts the Crew team used in their slide deck. Above you can see that the line charts use the same color palette, size, and typography. If the designers would have used a different example, the audience would be distracted trying to decipher the information. 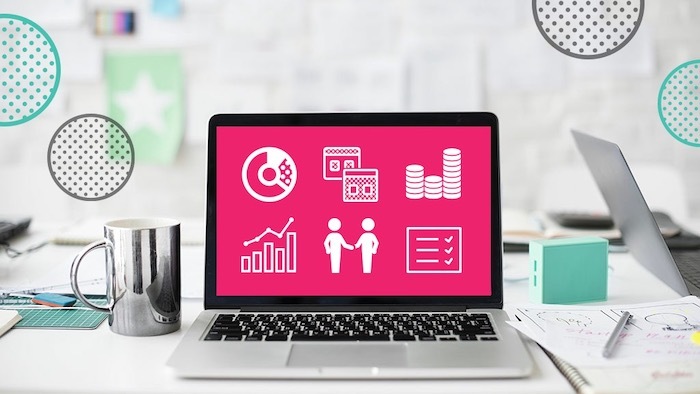 But consistent design across multiple visualizations will ensure your audience can make comparisons and the right conclusions. A good background image is the foundation of a great presentation. There are millions of stock photos out there for you to pick from, so finding a few great ones shouldn’t be hard. However, when you’re picking your presentation background images it’s important to make sure it matches your message or brand. Take a look at this presentation example, the slightly crumpled paper fits an eco-friendly startup very well. This minimalist background image was a great choice for this presentation as well. Especially because eco-friendly living and minimalism share some of the same core tenants. Highlighting digital problems is tough when you have limited space and time. Like when you’re pitching your new digital product to a room full of investors. 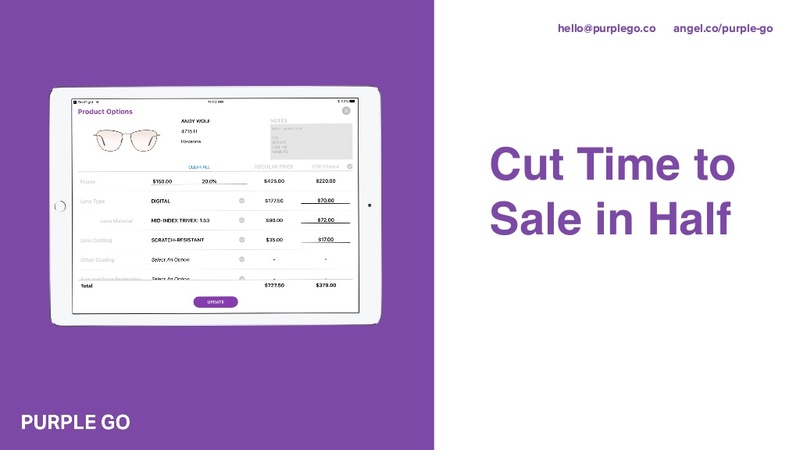 The best pitch decks include screenshots of the problem that your digital product is solving. 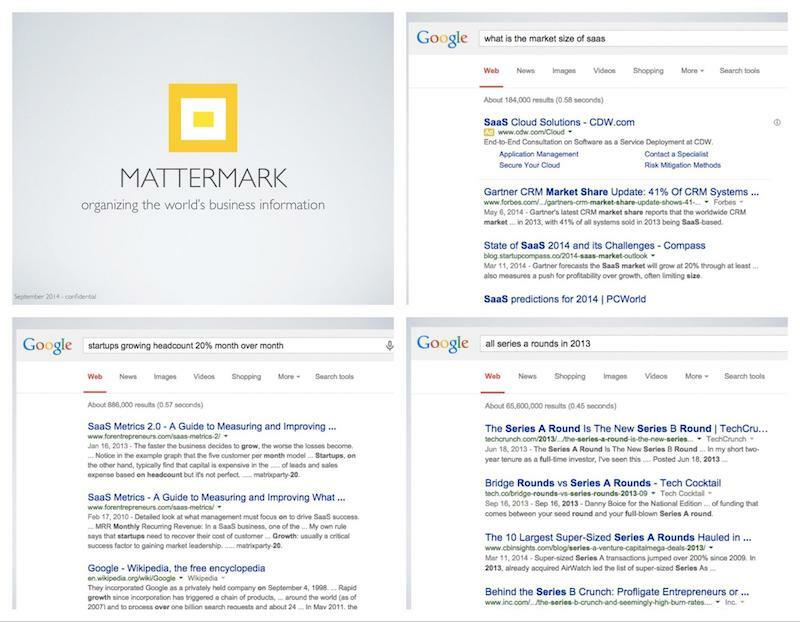 As you can see above, the people from Mattermark used screenshots to show how unorganized SAAS reporting was. At that time it was spread over a ton of different sites, with different reporting standards and values. Their product solved this messy reporting by bringing all of the data and information under one roof. It would be difficult to sell an investor or audience member on their product just by talking about the market. Mainly because not a lot of people have experience in that specific niche. But with a handful of screenshots, they were able to highlight the product potential almost instantly. 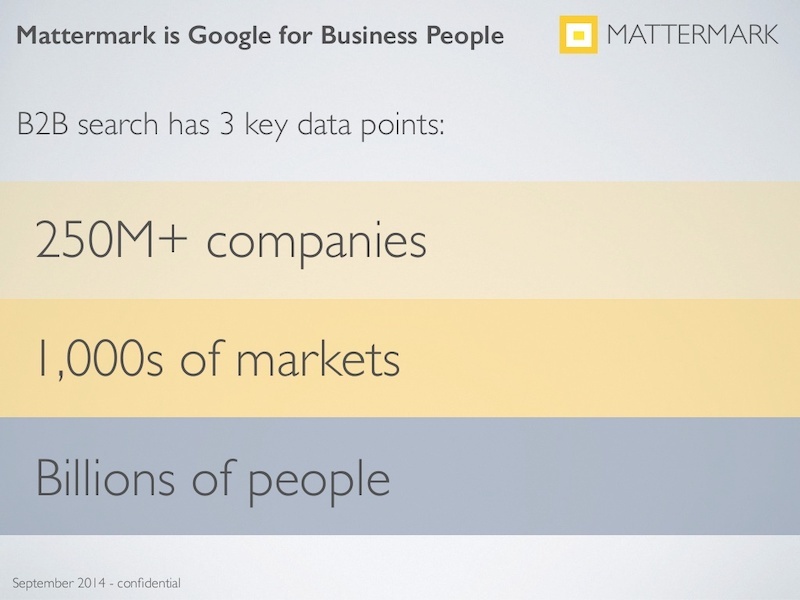 In the slide above, you can see the team at Mattermark stuck to the rule of three. 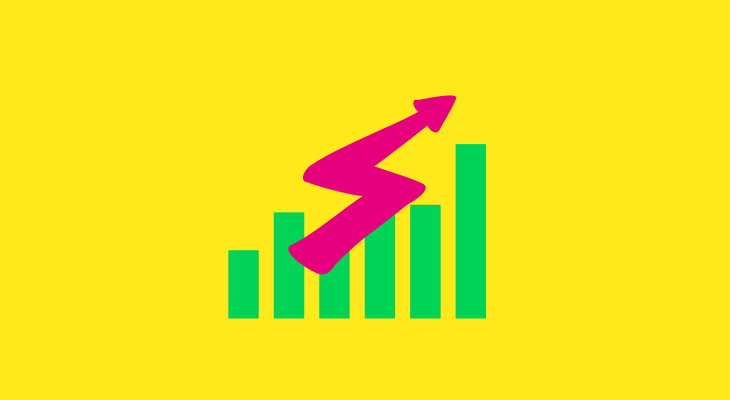 This rule will help you keep your team from overwhelming the audience with a flood of stats or figures. They also decided to make these figures a little easier to consume by highlighting them in different colors. 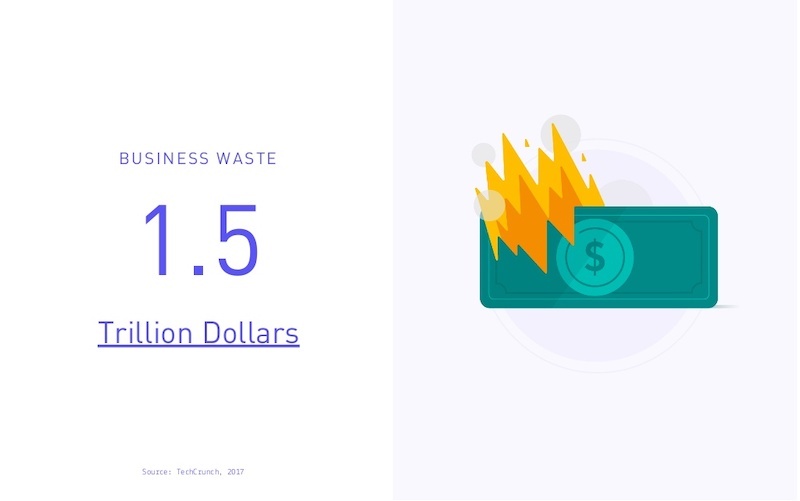 Not only will this make the slide almost effortless to skim, but the varied colors will also make the numbers stick out in an investors mind. 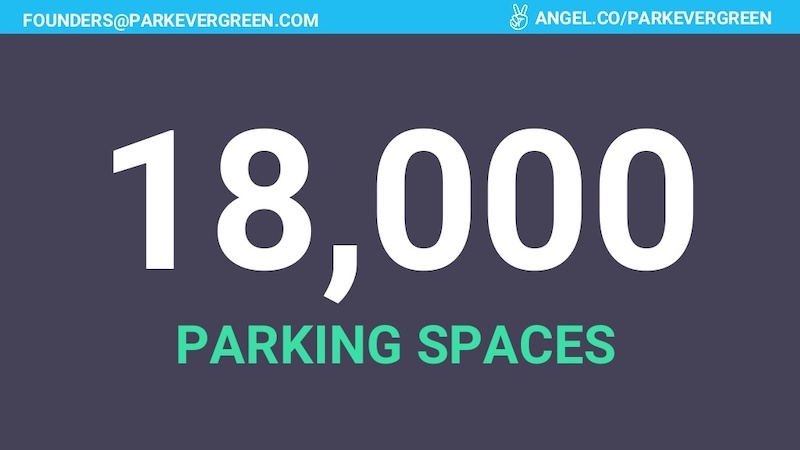 Compared to a boring list of figures, it’s a lot easier to remember three distinct colored numbers. Plus because the background colors get darker as they go, it will naturally pull the reader’s eyes down the slide. 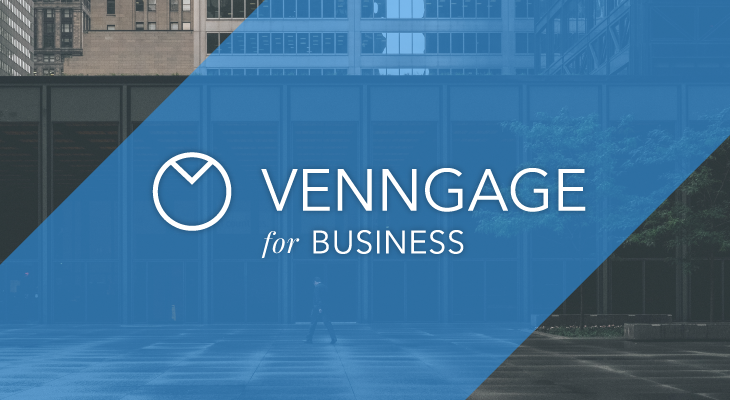 In a lot of our presentations, we talk about how Venngage started from humble beginnings and has grown to a 50+ person company in just a few years. That’s because people really love origin stories. 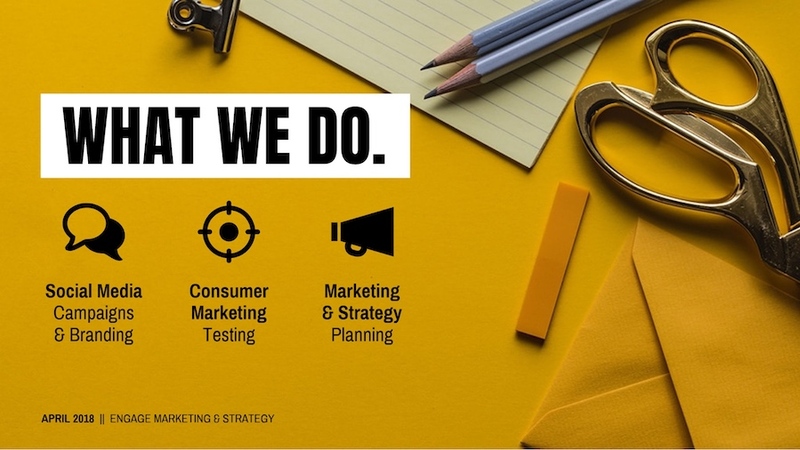 It helps the audience connect with your brand and see where it came from. Plus in this day and age, consumers love to see a brand build itself up from nothing. 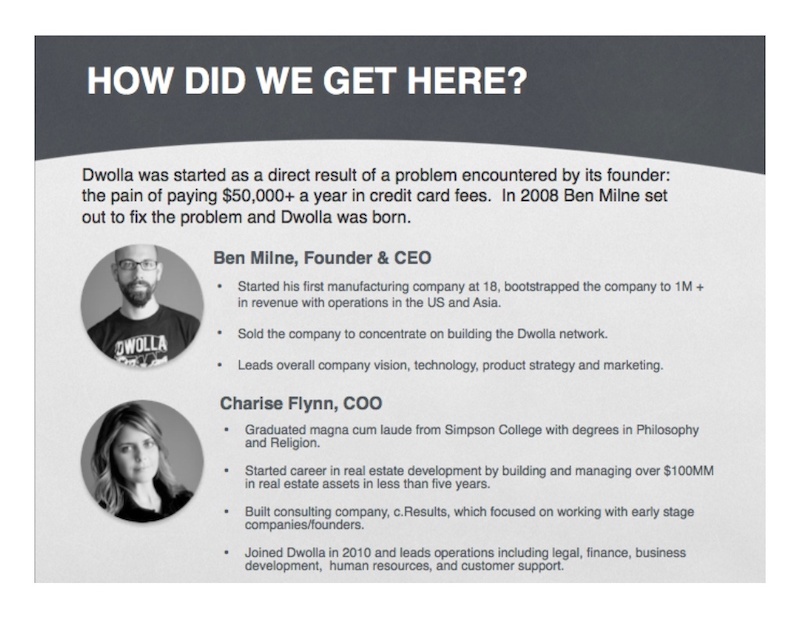 For example, take a look at the pitch deck from Dwolla above. In a single sentence, they are able to outline why they were founded. This rather straightforward statement both identifies the main problem they are wanting to solve, and why the company was founded in the first place. Just be sure to talk about your company founding in the first few slides of your pitch. Otherwise, it won’t have the same impact on the audience. 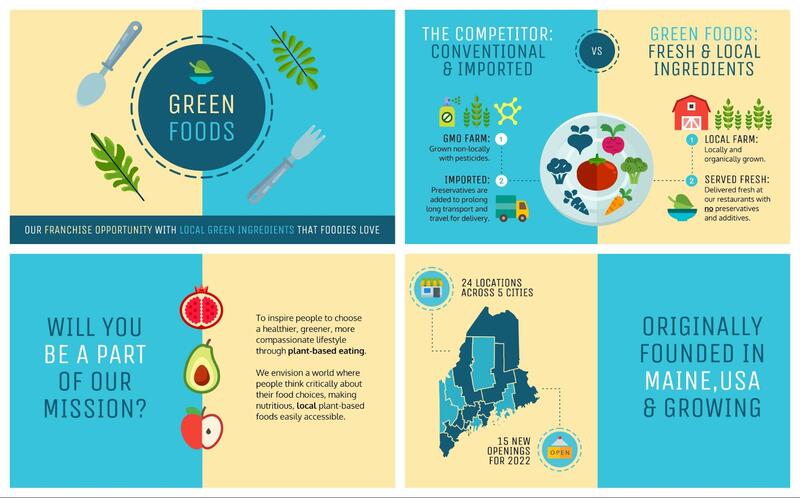 As a design company, we always love to see people create great visualizations in their pitch decks. Particularly when these visuals help illustrate a certain part of your presentation. Like when it comes to talking about your ideal users! I have seen a lot of brands just talk about their users, but I would recommend creating visual user personas. 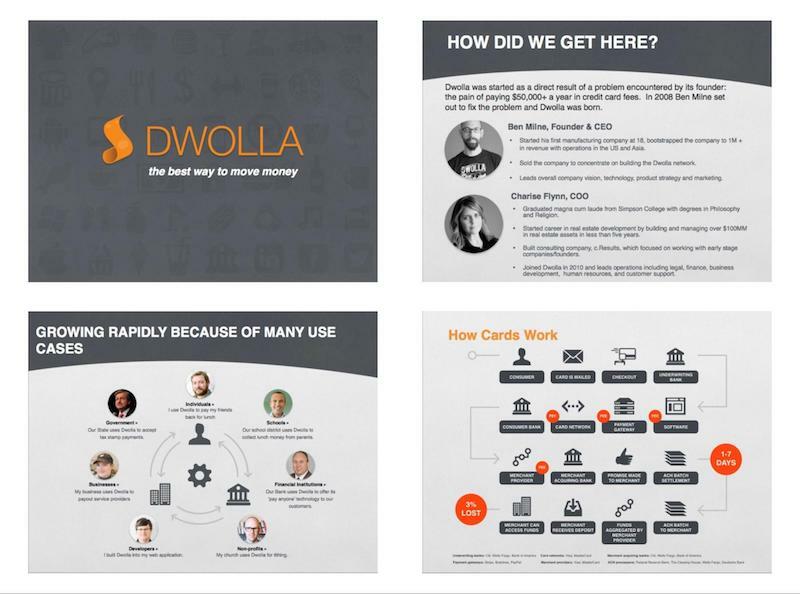 As you can see above, the Dwolla designers created a few visual user personas for each of their main use cases. 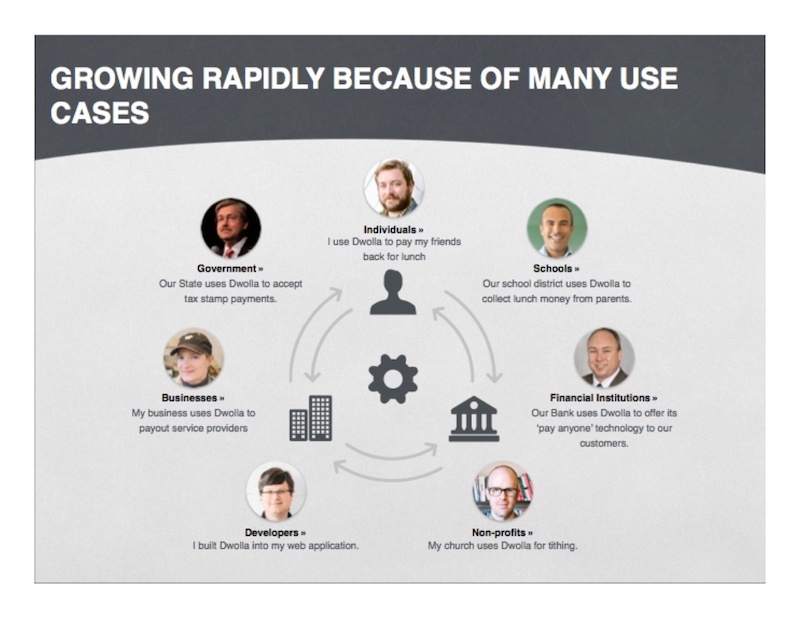 These visual user personas can help the audience put a real-ish face to your user base. And if you have many ideal users, like Dwolla, it can help them keep each group organized. 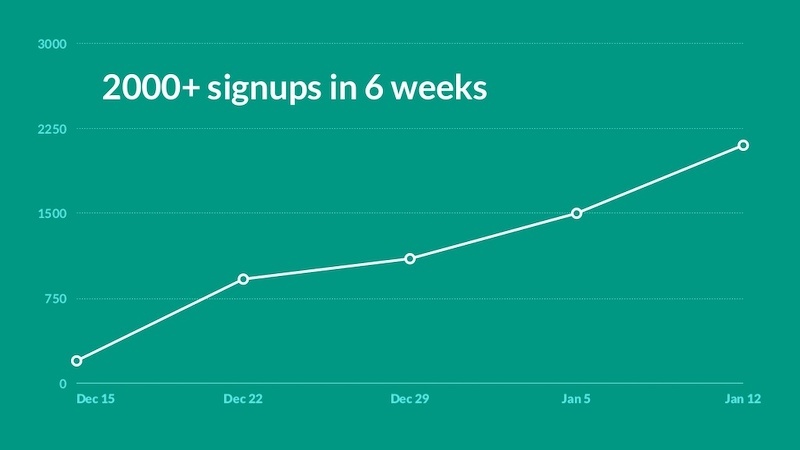 Be proud of your brand’s growth and metrics in your slide deck. You all worked hard to grow a company from nothing and that’s a big achievement! So why would you want to make that growth hard to see? You wouldn’t! However, I have seen a lot of people inadvertently hide their key metrics by using small graphs and charts. The only solution to this problem is…bigger graphs! 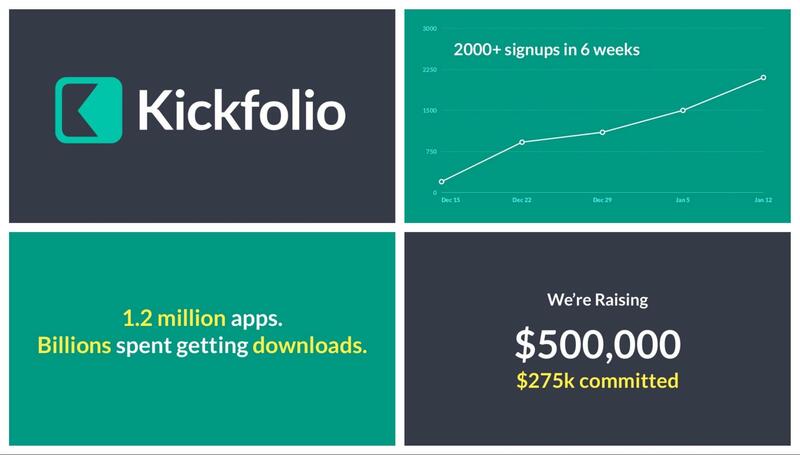 And I mean huge graphs, like Kickfolio used in their pitch deck above. Their graph is so large and imposing, every audience member could see it clearly. Icons have been making a comeback in the design world over the past few years. 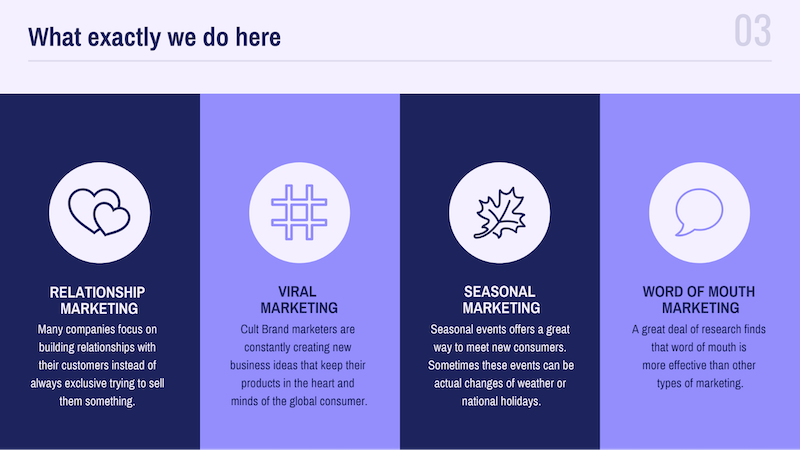 According to this year’s graphic design trends, they will continue to be extremely popular and can add a little bit of whimsy to any pitch deck. 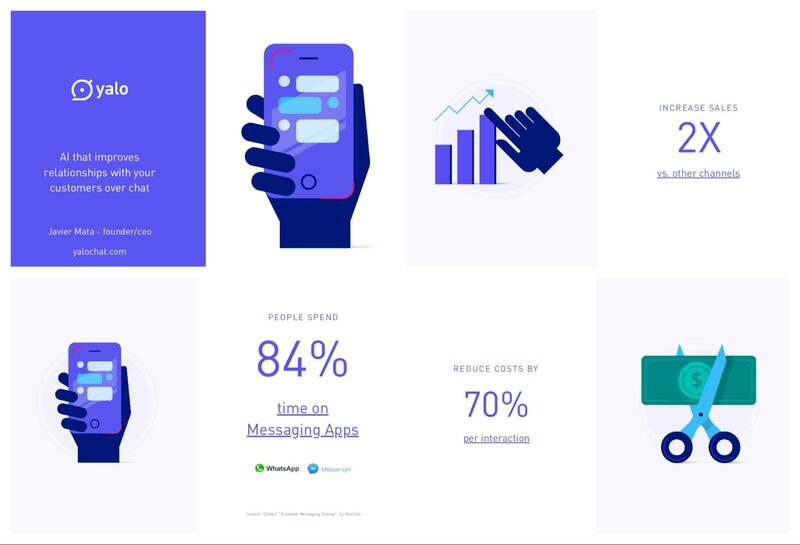 This presentation from Yalochat is one of the best examples of using illustrated icons correctly. Each icon that they used perfectly illustrates the point they are making on each slide and gives you a ton of instant context. They will definitely catch the eye of almost any audience member because they have been used so well. Just remember to follow their lead and use consistently designed icons! I could write a whole article about using icons in your presentations correctly. There are so many ways you can use them to upgrade your slides. Each of the main points has an icon that gives a little instant visual context to the audience. 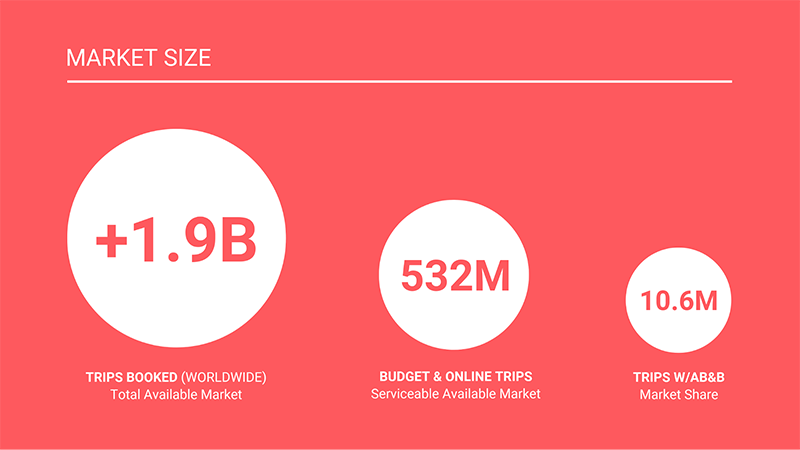 These icons also draw the eye almost immediately to these important facts and figures as well. Just remember to use icons that have a similar style and color palette. Otherwise, you run the risk of them becoming a distraction. Color isn’t just about making your designs looks good. It can also help you draw attention to important information. 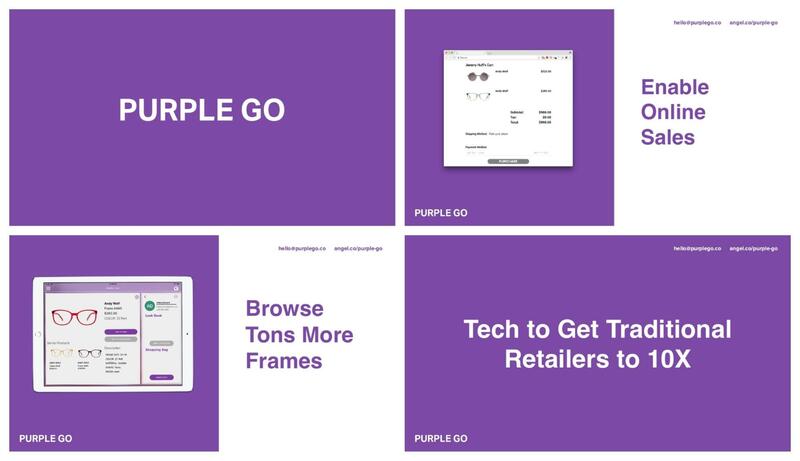 For example, take a look at this simple pitch deck from Purple Go. They contrast deep purple with white to help certain sentences pop. 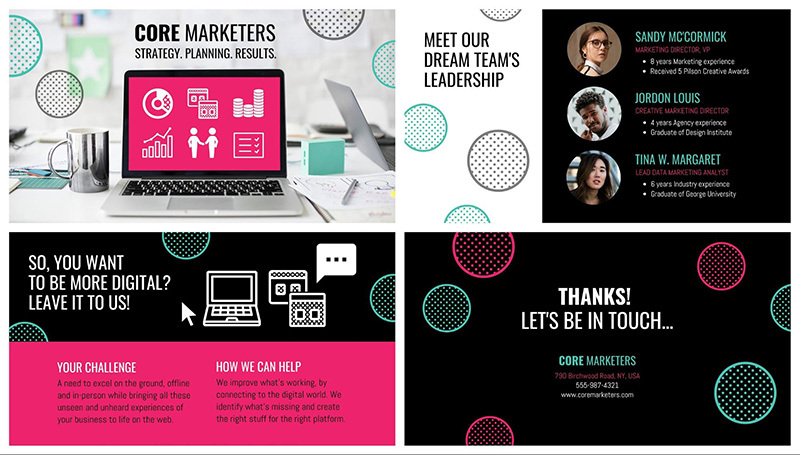 This is a simple way to give your slides a lot of impact; pick colors that contrast boldly with each other. I’m guessing your pitch deck is already going to touch on how you stand out from the competition. Bug just listing a few things that set you apart in the industry may not be enough on your slide deck. You may need to add some visual cues to help the audience out. 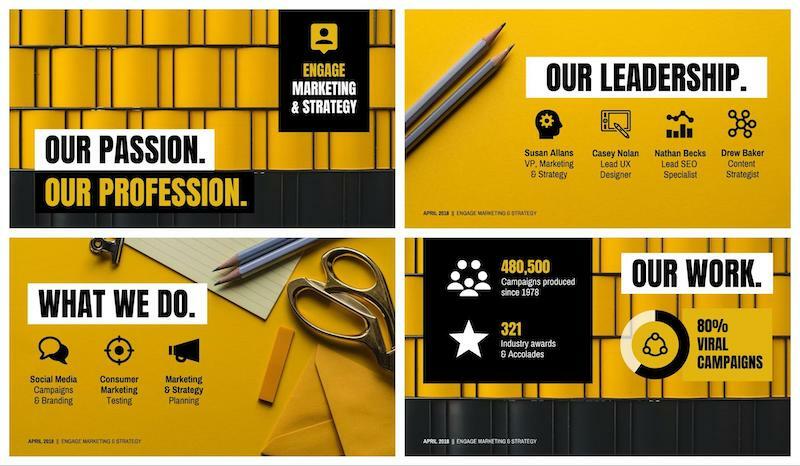 In this minimalist pitch deck template, our designers used visuals to make the main company stand out even more. And best of all, it doesn’t distract from the minimalist theme of the presentation. This simple addition to your slides will make your help your information jump off the slide. And provide a strong visual break from the other related companies. 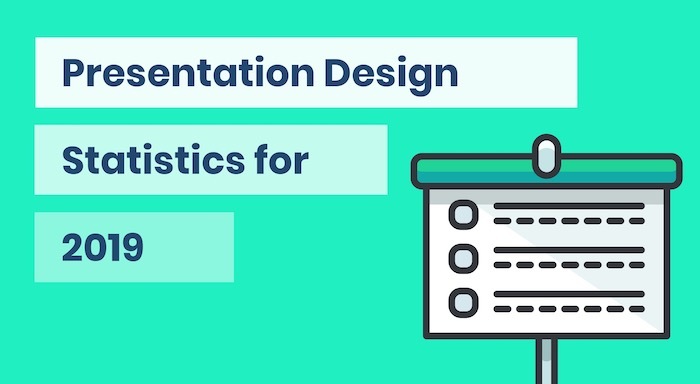 Generally, slide decks are full of important metrics that they want you to remember. But not all of those numbers are presented in a way that would make them easy to remember. Some are hidden in long paragraphs, while others are smashed together with less important findings. With this approach, the audience members place their full attention on that number. And they will be able to recall the related information a lot quicker. 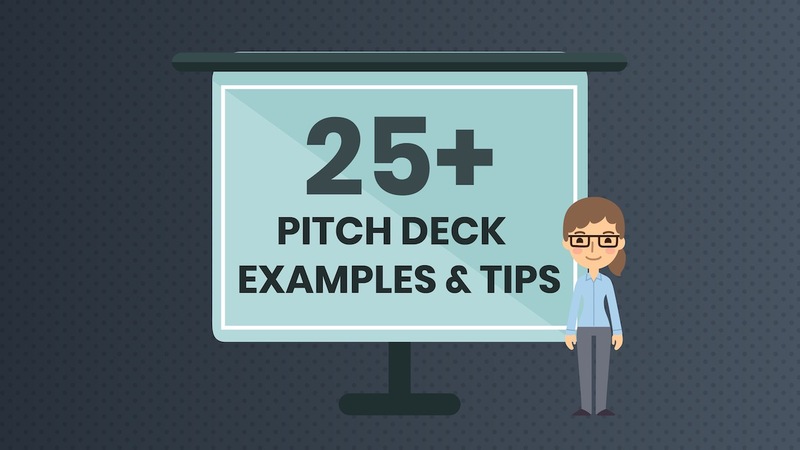 It may look overly simple to some, but the best pitch decks use this tactic a lot. 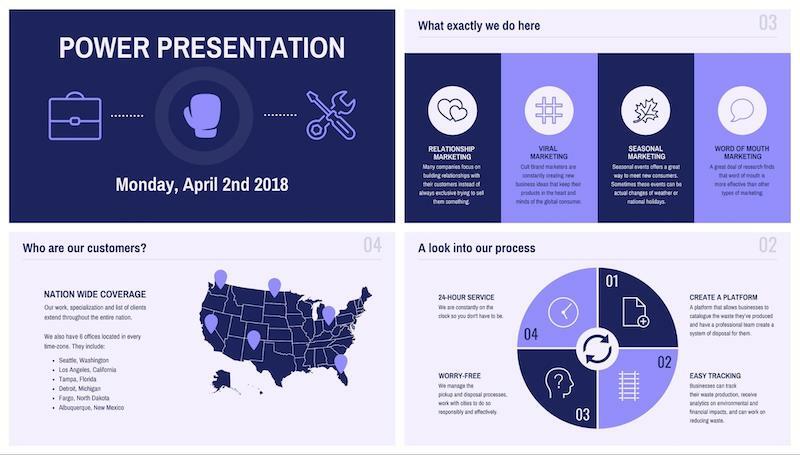 You probably know that presentations don’t always run as smoothly as planned. With breaks and technical problems, the time between presentations often ends up being rather long. A lot of the time you see the title slide longer than the whole presentation actually takes. So if you really want to build some anticipation for your pitch, create a minimalist title slide. 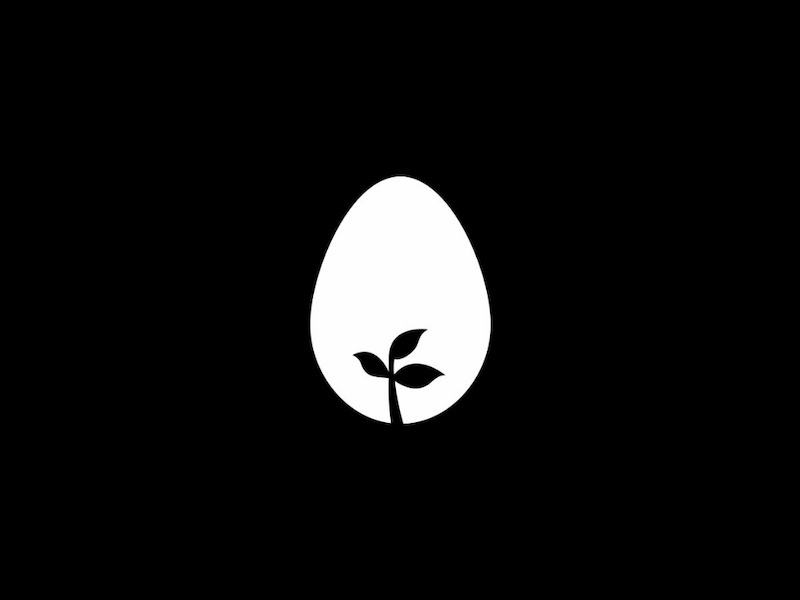 As you can see above, the designers at Hampton Creek did just this. The lack of information will make the spectators want to learn more about your brand. And you will most likely have a more engaged group of people. The only negative part of this tactic is that no one is going to know the name of your company. 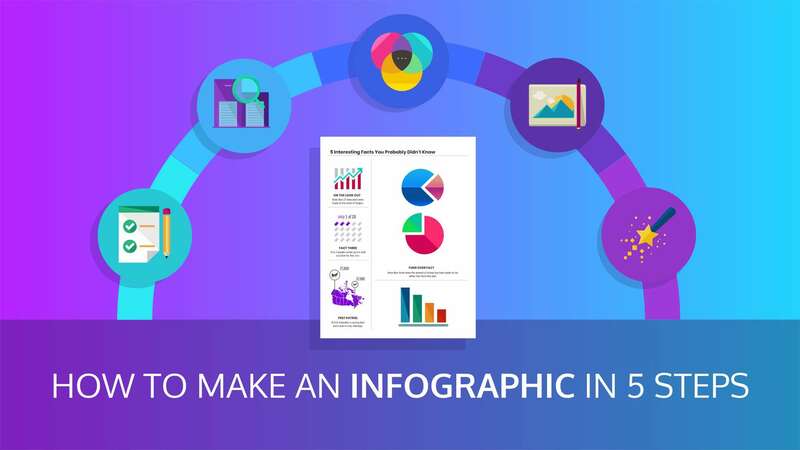 Most of the time your pitch deck background images are supposed to be used in a supporting role. These beautiful stock photos are meant to fade, well, into the background. Then all of your important information is added on top of them. 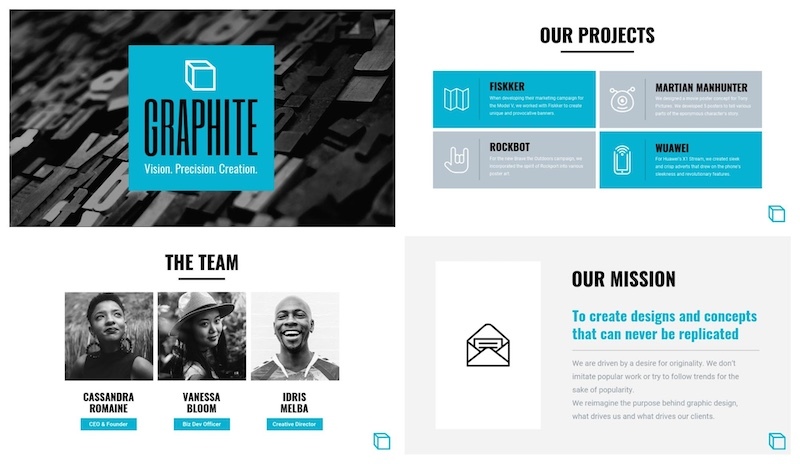 However, you can also design your presentation around the background images to create the best pitch deck. I think this makes each of the slides feel more real, and like it was almost printed on the paper! 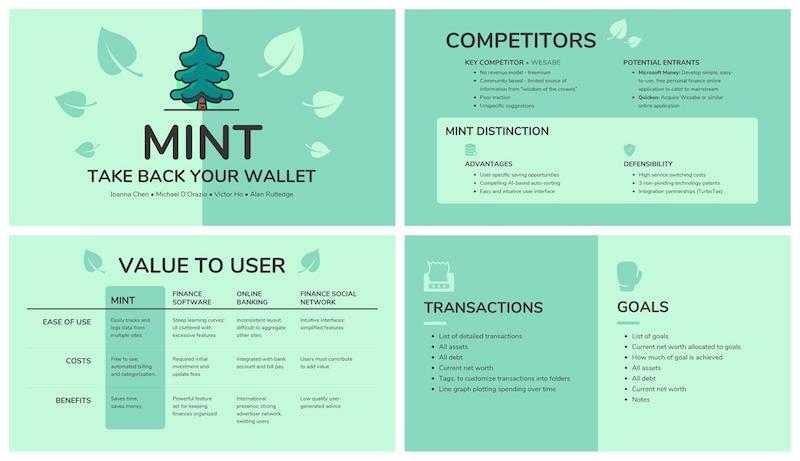 Plus no one can really copy your pitch deck layout, so you will instantly stand out from other companies. The only words of advice I have are to pick photos that share the same color palette and theme. Otherwise, the benefits of using these kinds of presentations backgrounds will be lost. People hate doing math. So you never want to make the audience or investors try to do quick math on any of your graphs or charts. Out of all the tips in this article, this one might be the most important. Mainly because forgetting this idea could instantly doom your brand. Especially when you’re dealing with millions of dollars, tiny percent changes or other complicated numbers. That’s why I recommend you “do the math” on every slide you include a graph or chart. Kinda like how Sickweather did above! 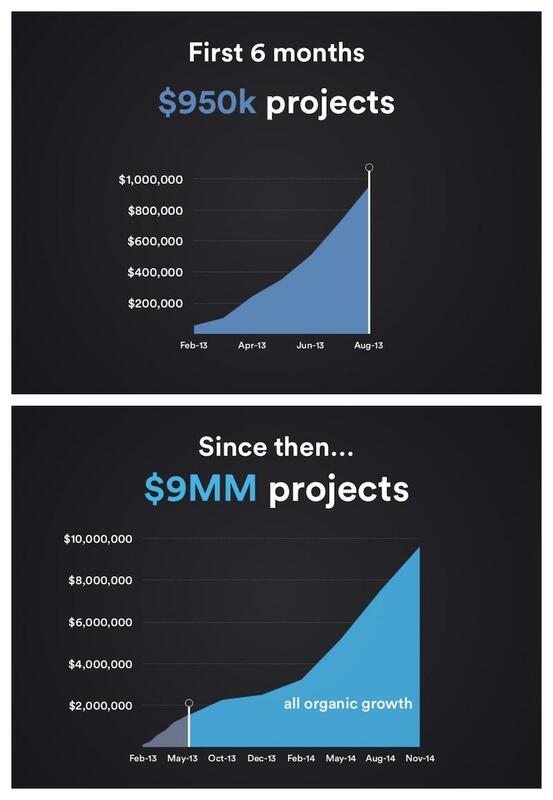 By pulling out the main growth metrics from the graph, they made this slide a lot more consumable. And showed the audience exactly what they need to pay attention to on slide. You made it to the end of this rather long article! But I think we covered a ton of great tips that can help you create the best pitch deck for your company.